Rainbow Mixed Lolly Bar | JOLLY JACKS JUMPING CASTLES! Mixed lollies are a fantastic addition to your next party or event. They are sure to add colour, flavour and lots of excitement for the kids, as well as the adults. A lolly bar will certainly complete the party vibe, and makes an ideal combination to a jumping castle and pop corn machine, creating that party-carnival atmosphere. 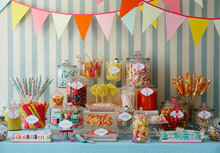 Jolly Jacks Jumping Castles will deliver and set up the mixed lolly bar, ready to shine and amaze. Our team will then collect supplies on completion, but of course leaving behind whatever lollies remain. Jolly Jack’s mixed lolly bar comes as one standard serving size, enough for many kids all day long. Mixed lollies always come unopened in their bags, which are opened upon arrival and filled in selective jars.